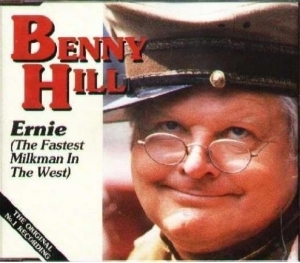 In the U.S., Benny Hill is known for his syndicated television show with the British comedian going all wide eyed when pretty (and often scantily clad) young women walked by and for its abundant use of Boots Randolph's "Yakety Sax" in chases. In Britain, he also had a few popular records but none bigger than his 1971 Christmas number 1 "Ernie (The Fastest Milkman in the West)". The song stayed at number 1 starting on December 11, 1971, 46 years ago today. In fact, December 11 seems to be some sort of magic day in England for novelty and comedy records to reach number 1. It also happened three years earlier when the comedy group Scaffold topped the charts with "Lily the Pink" and again, in 1993, when Mr. Blobby, a character on Noel Edmunds' Saturday night variety show, topped the charts with his self-titled single. "Ernie" was written by Hill in 1955 as the theme for an unproduced film of Hill's time as a Milkman and, while it is a different song, there are a number of similarities to Frank Gallop's 1966 song "The Ballad of Ernie". The song was originally performed on Hill's variety show in 1970. The clip below is a lower quality tape of that performance, shot during a time when the technicians for the network were on strike. The next year, it was included on the Hill album Words and Music.